That’s how my dad always referred to any non-family oriented holiday. This meant St. Patrick’s Day, New Year’s Day, Columbus Day…you name it…were all just days when mail delivery was questionable and some workplaces were closed. It’s important to note that my dad is a fireman, so his schedule doesn’t take into account holidays. Idiots with dry, unwatered Christmas trees light them up with candles on Christmas Eve, Day and any other day of the holiday season, so in his line of work there isn’t really a day off. It’s also important to note that he doesn’t drink, so these Cinco de Mayo-type excuses to get plastered on a weekday never appealed to him either, but I think more than anything he recognizes holidays where families come together. Christmas, Thanksgiving and a few family cookouts complete his recognized holidays, which brought me to the way I feel about my birthday. I love birthdays, just not mine. It’s always so much fun to make a big deal about people on their birthdays and buy them presents and drinks, but on my birthday I can’t help but feel narcissistic. People sing TO you…you can’t sing with them. I’m too self-aware to just let go and be pampered, so every year since I can remember I’ve found a way to get upset about my birthday. I laid awake the night before my 16th, wondering if I would die. I was convinced God would never let me drive legally. The night before my 18th, I laid awake knowing that any crimes I committed the next day could result in me being lethally injected…yeah it gets that dark. The birthday, to me, is just a reminder of how far I haven’t come in so long. It comes with the territory of living within the same one-hour stretch of highway for your entire life…plus the knowledge that Maria Sharapova won Wimbledon at age 17. But I did have one great birthday. Two, actually. One was my eighth. Cal Ripken Jr. was my favorite baseball player and I had seen him play just THREE games before he broke Lou Gehrig’s consecutive games streak in early September. His number, of course, was 8. So my mom made a white, circular cake with orange baseball seams and an Orioles font 8 in the middle. Oh. My. Gosh. It was the best cake ever! Fast forward 13 years to when I met Sonja Jones. Her birthday (March 12) is the best day ever, and if you don’t agree…well she doesn’t care. Sonja learned of my disgust at my birthday and sought to change it. She arranged a day-long scavenger hunt that ended with my parents and all of my friends at a party complete with two replica cakes of my favorite birthday ever! (And, in a throwback to my Kate Nash post: Mouthwash defines this birthday in my head. Not because it was a Friday night, but because it was a Saturday night and I recall being drunk and singing it with the actual night tweaked in very loudly). EDITOR’S NOTE: There was another Orioles cake produced by Kate Shefte, Ana Andruzzi and my friends at ‘Technician‘ last year on my birthday. 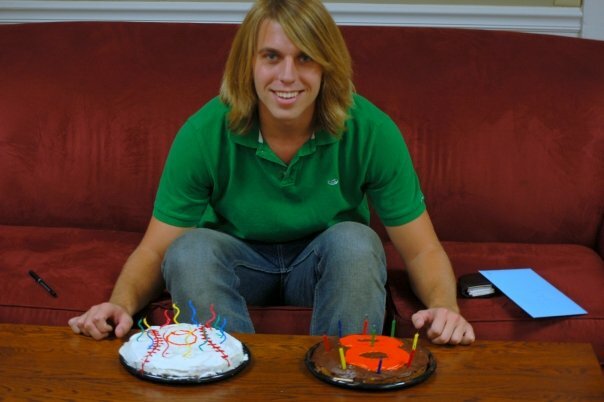 Its significance was not lost on the author of this post, but the cake decorations were more coincidental than on his 21st birthday. Nevertheless, the cake should have been mentioned at this point, and the author failed to do so. It was delicious. Of course 21 is a special birthday in the United States, but this one I set apart because of what it taught me: birthdays aren’t necessarily for those who celebrate them. Sometimes they’re for your friends. Me with my two replica cakes courtesy of Sonja. Photo courtesy of Jeffrey Fowler. Saturday, Oct. 11, 2008. Sometimes it gives them a chance to spend money on you. Sometimes it gives them an excuse to get you drunk. Sometimes it’s just a time when they take a Facebook post and use it to show you they still remember you and cherish whatever friendship you have or have lost. That’s why I like birthdays so much…I can celebrate someone for no other reason than their existence. That’s when I realized that the truly narcissistic thing about a birthday is when you don’t allow OTHERS to make a big deal about it. Saying “It’s just another day” or posting a ridiculously long rant on your blog about how much you don’t care for your birthday is the selfish move. Acting like the U.S. Government decided to place Columbus Day on your birthday simply because Ty Johnson Appreciation Day is difficult to fit in a calendar square allows your friends the opportunity to make your day special. Not embracing a birthday is like refusing to accept compliments…nobody feels good about it. So while I still hesitate to tell people about my birthday, I’ve come to appreciate it for what it is: an excuse to live one day like you would like to live every day. For me that means I’m doing a lot of illegal parking and pushing a lot of yellow lights. Woo hoo! ummmmmm and its your Favorite lil cousins birthday tooo!!!!!!! so that makes it super special! Ty! I love, love this post. I know exactly what you mean. It took three years and two amazing friends (and possibly 10 birthday celebrations) for me to enjoy my birthday. Thanks for putting it into words.